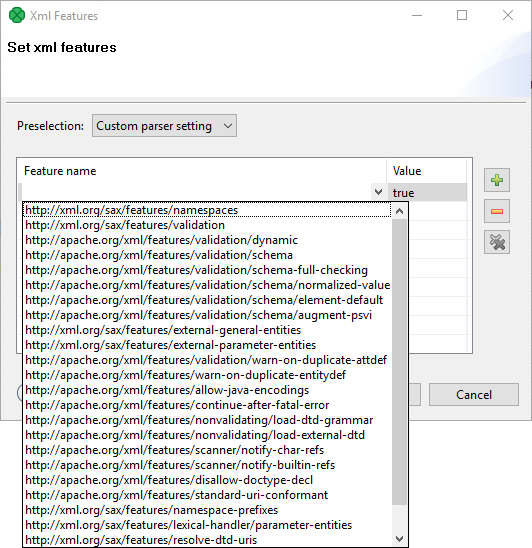 In XMLExtract,XMLReader and XMLXPathReader, you can configure the validation of your input XML files by specifying the Xml features attribute. The Xml features configure validation of the XML in more detail by enabling or disabling specific checks, see Parser Features. It is expressed as a sequence of individual expressions of one of the following form: nameM:=true or nameN:=false, where each nameM is an XML feature that should be validated. These expressions are separated from each other by a semicolon. In this dialog, you can add features using the Plus button, select their true or false values, etc.